When it is stated that “contains all that is needed to generate extraordinary levels of non-randomness” is factually not accurate, for one is making the mistake that many reductionists make by assuming that all complexity arises from bottom-up causation alone, and are completely ignoring the effects of top-down causation. The reason is as follows: Lower levels of complexity are necessarily governed by uncertainties due to quantum mechanics, it is not clear how these quantum uncertainties transition to a classical state. Mathematically, these uncertainties that are at the heart of the random variation that is cited are governed in a Hilbert, L^2 Lebesgue integrable space. Classical systems, determined by phase space manifolds have these probabilistic domains in the cotangent bundle of the manifold. The article is essentially saying that the cotangent bundle determines the phase space and not the other way around which is not correct. Further, there remains the unsolved issue of how the quantum fluctuations become classical (unless you follow the untestable many worlds route, which has major problems – see S D Hsu Modern Physics Letters A27: 1230114 (2012) for one interesting comment, and the writings of Sudarsky. On the other side, top-down causation via cosmology and Einstein’s equations seed the correct conditions for dynamical Darwinian evolution to take place to begin with, for some reason, the author completely leaves this out. Without a question, the author is an expert an evolutionary biology, but I am afraid he has looked through these issues through a very narrow lens, which does not do the issue a full and complete justification, and indeed, is responsible for much of the discomfort with evolutionary theory that is described so accurately and well in the article. I have two main aims. The first is general, and more philosophical (Section 2). The second is specific, and more closely related to physics (Sections 3 and 4). The first aim is to state my general views about laws and causation at different ‘levels’. The main task is to understand how the higher levels sustain notions of law and causation that ‘ride free’ of reductions to the lower level or levels. I endeavour to relate my views to those of other symposiasts. The second aim is to give a framework for describing dynamics at different levels, emphasising how the various levels’ dynamics can mesh or fail to mesh. This framework is essentially that of elementary dynamical systems theory. The main idea will be, for simplicity, to work with just two levels, dubbed ‘micro’ and ‘macro’ which are related by coarse-graining. I use this framework to describe, in part, the first four of Ellis’ five types of top-down causation. This paper extends the work of a previous paper [arXiv:1208.2611] on the flow of time, to consider the origin of the arrow of time. It proposes that a `past condition’ cascades down from cosmological to micro scales, being realized in many microstructures and setting the arrow of time at the quantum level by top-down causation. This physics arrow of time then propagates up, through underlying emergence of higher level structures, to geology, astronomy, engineering, and biology. The appropriate space-time picture to view all this is an emergent block universe (`EBU’), that recognizes the way the present is different from both the past and the future. This essential difference is the ultimate reason the arrow of time has to be the way it is. One of the basic assumptions implicit in the way physics is usually done is that all causation flows in a bottom up fashion, from micro to macro scales. 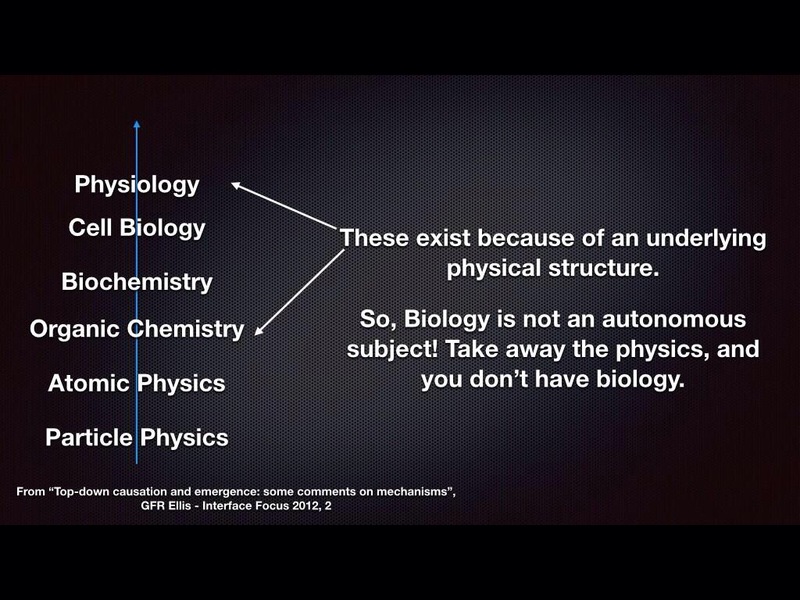 However this is wrong in many cases in biology, and in particular in the way the brain functions. Here I make the case that it is also wrong in the case of digital computers – the paradigm of mechanistic algorithmic causation – and in many cases in physics, ranging from the origin of the arrow of time to the process of state vector preparation. I consider some examples from classical physics, as well as the case of digital computers, and then explain why this is possible without contradicting the causal powers of the underlying microphysics. Understanding the emergence of genuine complexity out of the underlying physics depends on recognising this kind of causation. Imari Walker, Sara; Cisneros, Luis; Davies, Paul C. W.
Top-down causation has been suggested to occur at all scales of biological organization as a mechanism for explaining the hierarchy of structure and causation in living systems. Here we propose that a transition from bottom-up to top-down causation — mediated by a reversal in the flow of information from lower to higher levels of organization, to that from higher to lower levels of organization — is a driving force for most major evolutionary transitions. We suggest that many major evolutionary transitions might therefore be marked by a transition in causal structure. We use logistic growth as a toy model for demonstrating how such a transition can drive the emergence of collective behavior in replicative systems. We then outline how this scenario may have played out in those major evolutionary transitions in which new, higher levels of organization emerged, and propose possible methods via which our hypothesis might be tested. Annals of Physics, Volume 327, Issue 7, p. 1890-1932. This paper is based on four assumptions: 1. Physical reality is made of linearly behaving components combined in non-linear ways. 2. Higher level behaviour emerges from this lower level structure. 3. The way the lower level elements behaves depends on the context in which they are embedded. 4. Quantum theory applies to the lower level entities. An implication is that higher level effective laws, based on the outcomes of non-linear combinations of lower level linear interactions, will generically not be unitary; hence the applicability of quantum theory at higher levels is strictly limited. This leads to the view that both state vector preparation and the quantum measurement process are crucially based on top-down causal effects, and helps provide criteria for the Heisenberg cut that challenge some views on Schrödinger’s cat. A reliable understanding of the nature of causation is the core feature of science. In this paper the concept of top-down causation in the hierarchy of structure and causation is examined in depth. Five different classes of top-down causation are identified and illustrated with real-world examples. They are (1) al gorithmic top-down causation; (2) top-down causation via nonadaptive information control; (3) top-down causation via adaptive selection; (4) top-down causation via adaptive information control; and (5) intelligent top-down causation (i.e., the effect of the human mind on the physical world). Recognizing these forms of causation implies that other kinds of causes than physical and chemical interactions are effective in the real world. Because of the existence of random processes at the bottom, there is sufficient causal slack at the physical level to allow all these kinds of causation to occur without violation of physical causation. That they do indeed occur is indicated by many kinds of evidence. Each such kind of causation takes place in particular in the human brain, as is indicated by specific examples. Auletta, G.; Ellis, G. F. R.; Jaeger, L.
It has been claimed that different types of causes must be considered in biological systems, including top-down as well as same-level and bottom-up causation, thus enabling the top levels to be causally efficacious in their own right. To clarify this issue, important distinctions between information and signs are introduced here and the concepts of information control and functional equivalence classes in those systems are rigorously defined and used to characterise when top down causation by feedback control happens, in a way that is testable. The causally significant elements we consider are equivalence classes of lower level processes, realised in biological systems through different operations having the same outcome within the context of information control and networks. Physics and chemistry underlie the nature of all the world around us, including human brains. Consequently some suggest that in causal terms, physics is all there is. However, we live in an environment dominated by objects embodying the outcomes of intentional design (buildings, computers, teaspoons). The present day subject of physics has nothing to say about the intentionality resulting in existence of such objects, even though this intentionality is clearly causally effective. This paper examines the claim that the underlying physics uniquely causally determines what happens, even though we cannot predict the outcome. It suggests that what occurs is the contextual emergence of complexity: the higher levels in the hierarchy of complexity have autonomous causal powers, functionally independent of lower level processes. This is possible because top-down causation takes place as well as bottom-up action, with higher level contexts determining the outcome of lower level functioning and even modifying the nature of lower level constituents. Stored information plays a key role, resulting in non-linear dynamics that is non-local in space and time. Brain functioning is causally affected by abstractions such as the value of money and the theory of the laser. These are realised as brain states in individuals, but are not equivalent to them. Consequently physics per se cannot causally determine the outcome of human creativity, rather it creates the possibility space allowing human intelligence to function autonomously. The challenge to physics is to develop a realistic description of causality in truly complex hierarchical structures, with top-down causation and memory effects allowing autonomous higher levels of order to emerge with genuine causal powers. Testa, Bernard; Kier, Lemont B. The formation of complex systems is accompanied by the emergence of properties that are non-existent in the components. But what of the properties and behaviour of such components caught up in the formation of a system of a higher level of complexity? In this assay, we use a large variety of examples, from molecules to organisms and beyond, to show that systems merging into a complex system of higher order experience constraints with a partial loss of choice, options and independence. In other words, emergence in a complex system often implies reduction in the number of probable states of its components, a phenomenon we term dissolvence. This is seen in atoms when they merge to form molecules, in biomolecules when they form macromolecules such as proteins, and in macromolecules when they form aggregates such as molecular machines or membranes. At higher biological levels, dissolvence occurs for example in components of cells (e.g. organelles), tissues (cells), organs (tissues), organisms (organs) and societies (individuals). Far from being a destruction, dissolvence is understood here as a creative process in which information is generated to fuel the process of self-organisation of complex systems, allowing them to appear and evolve to higher states of organisation and emergence. Questions are raised about the relationship of dissolvence and adaptability; the interrelation with top-down causation; the reversibility of dissolvence; and the connection between dissolvence and anticipation.